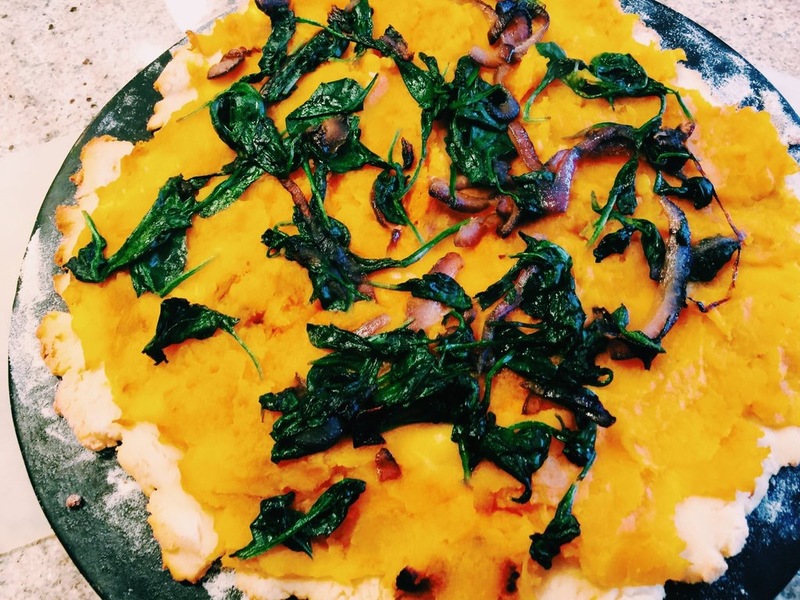 The first time I served this Gluten Free Butternut Squash Pizza was as an appetizer cut into little triangles when friends came to dinner. It was SO yummy that it has become a weeknight favorite for my whole family! Heat oven to 425 degrees F. Cut Butternut Squash in half, lengthwise and scoop out seeds. Brush oil on baking sheet and roast cut side down for 40 minutes. In a large pot (or Lodge Cast Iron Wok) add 1Tbs of oil and sauté onion and pepper. If it gets dry, add some veggie broth a few Tbs at a time. When the veggies are soft add the spinach and stir until wilted. Place pizza shell on a clay pizza sheet or regular baking sheet. Scoop out one half of the butternut squash (reserve second half for another use) onto the pizza shell and spread like sauce. Top with sautéed veggies and spinach. Cook according to pizza shell directions. (usually 375 – 400 degrees F for 10 – 20 minutes). Enjoying this right now with my two children. They really like it and it’s super easy to make! Love the butternut squash- I would never have thought of using it for a pizza, but it really works. Thanks for this recipe!